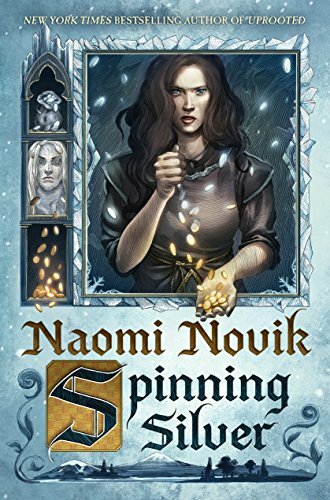 Inspired by the story of Rumpelstiltskin, Naomi Novik, author of UPROOTED, (one of the best books I’ve read this year) weaves another sweeping, entrancing modern-day fairytale with SPINNING SILVER. We meet Miryem, who despite being the granddaughter of wealthy moneylenders, struggles under the weight of her own family’s poverty. Her father, a moneylender too, cannot seem to collect the debts he is owed, so Miryem takes matters into her own hands to help her family. With intellect and steeled determination, Miryem collects, accepting goods and services in addition to coin. She brings in peasant girl, Wanda, who is no stranger to poverty and pain herself, and together, their fate begins to turn. Unfortunately for Miryem, her skill attracts the king of the Staryk—winter fey who raid the town year after year. Forced into a bargain she cannot break, Miryem is pulled into a magical realm, caught in a web far more tangled and dangerous than expected. Along with Wanda, and the daughter of a duke who is forced to wed a Tsar with many a dark secret, Miryem must figure out a way to break free from the Staryk and from the bargain that threatens to destroy them all. With spellbinding prose, Novik draws us into this vividly imagined, multilayered fable. Unraveling in multiple points of view, it was sometimes difficult to follow (especially on Audible), but the story itself, rife with intrigue and tension, kept me rapt. The romance is slower to blossom as compared to UPROOTED, but once those threads began to weave together, it made the narrative all the more consuming. I’ve become obsessed with Novik’s storytelling and I can’t wait to see what story she’ll share with us next.